Before we get into my gift guide for fitness gifts for men, let me make a disclaimer; I may not be a personal trainer, but I am a damn good shopper! 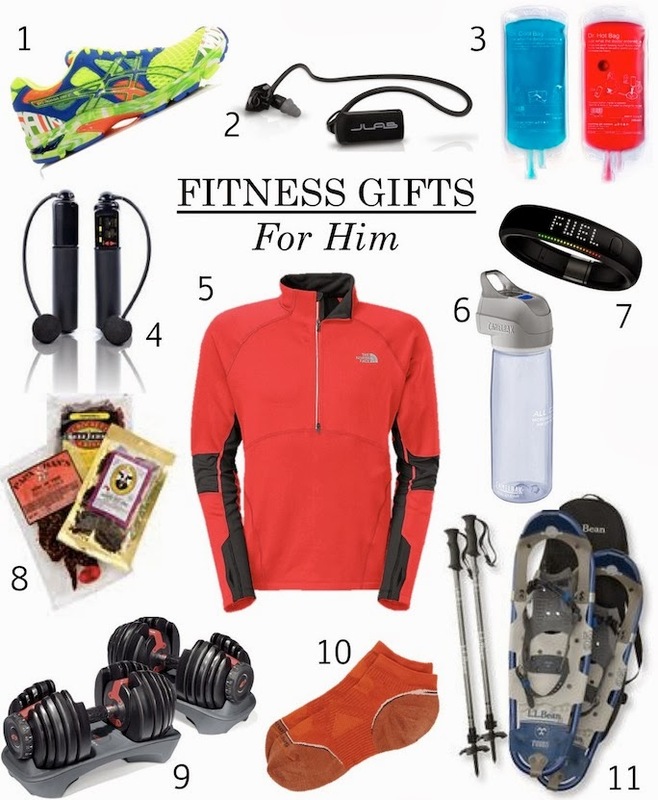 When giving gifts I do my research, so for this guide I logged some serious time on Men's Health, Esquire and Men's Fitness trying to find the best workout gear to give a guy that's in shape or that wants to be. 1. Asics Gel-Noosa Tri 8,$129.99: Sporty Spice has nothing on the guy running down the street in these Asics! Moisture wicking, lightweight and supportive the Gel-Noosa's are perfect fits for the training triathlete. 2. J Lab Go2 Bluetooth Headphones,$49.99: He will love the technology and functionality behind these blootooth headphones. Wire free and sweat proof, you can shuffle your music or take calls using this unbeatable set of headphones. Heck, I want a pair myself! 5. The North Face Pullover, $55: Lightweight, sweat wicking and weather shielding, this pullover is great for working out or walking to the gym in not so pleasant weather. The North Face is a go to for performance wear for both men and women. 6. CamelBak All Clear Purifier, $114.95: For the wilderness man in your life CamelBak's purification bottle uses UV technology to purify water in 60 seconds. Don't let him take another hike without it. 7. Nike FuelBand SE, $149: Get him geared up with one of the newest workout gadgets on the market, the Nike FuelBand SE Fitness Tracker. I don't know what this doesn't do...It tracks sleep, steps, calories, workouts and automatically syncs with iPhones. 8. Jerky of the Month Club, $74.85 for 3 months: If he's gone Paleo, a Jerky of the Month membership is the perfect gift - Christmas morning every month when he gets home to a package of healthy treats at his door! 9. Bowflex Adjustable Dumbells, $349: Meatheads rejoice! Bowflex adjustable weights (5 to 52.5 pounds) give guys the ability to pump iron in the comfort of their own home. 10. SmartWool PHD Running Socks, $15.97: Socks can be a determining factor in the comfort of your workout. These ultra light and padded socks come in a number of colors and are perfect for runs or hikes. 11. L.L, Bean Snowshoe Package, $199: Perfect for the outdoor lover, L.L. Bean's snowshoe package has everything he needs to get moving in freezing temperatures! Additional gift guides including tech gifts for men and hostess gifts for her can be found here. My husband would totally dig the Asics, thank for the inspiration! You should take a look at the Beats Powerbeats earphones for running as well - they're a damn fine choice!